Lexington South Carolina is located in Lexington County in the Midlands region of South Carolina. It is uniquely positioned halfway between New York and Miami, within 24 hour ground access to more than 70 percent of the U.S. market. The total area of the county is 699 square miles. The county seat is the Town of Lexington and is located approximately 12 miles from Downtown Columbia. It's about the results you care about in Lexington SC. We live and breathe real estate in Lexington and Columbia South Carolina. My passion for the business makes it easy for me to make a full-time commitment to my clients. By combining personal, one-on-one attention with dynamic web and e-mail resources, I provide 24/7 market coverage for my clients. Let's get together to talk about your home buying and/or selling plans. Call me at the office (803-358-0888) or send me an e-mail (Info@ExitREC.com), we'll set-up a time to meet that is easy and convenient for you. Lexington SC Real Estate - Homes for Sale in Lexington South Carolina. You also have access to our advanced market segments such as, Lexington Entry Level Homes, Lexington Median Homes, Lexington Upscale Homes, Lexington Luxury Homes, and Lexington Lots and Land for Sale in Lexington SC. Other neighborhoods in Lexington: Farming Creek, Golden Hills, Governors Grant, Hope Ferry Plantation, Kenwood, Oak Pointe, Olde Saluda, Richmond Farms, Secret Cove, Shadowbrooke, Timberland Place, and Vista Springs. Popular cities, towns, and areas for search: Chapin, Gaston, Gilbert, Irmo, Lake Murray, Lexington, West Columbia, in the Greater Columbia SC. Exit Realty of Lexington SC (803) 665-9516 your Lexington SC Real Estate Agency. 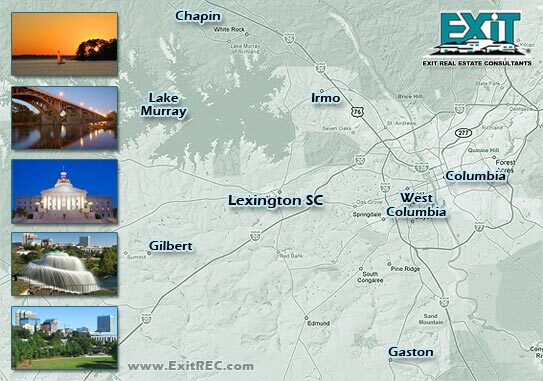 ExitREC Lexington Search.